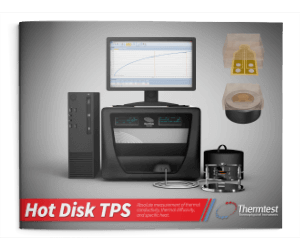 TPS 1500 | Thermtest Inc. The Transient Plane Source TPS 1500 is designed for measurement of thermal transport properties of low to mid-thermal conductivity materials, such as insulation and construction materials, from 0.01 to 20+ W/mK. The TPS 1500 Thermal Conductivity Instrument is designed for testing thermal transport properties of solids, liquids, pastes, and powders, including various types of geometry and dimensions with the use of special two-sided or single-sided TPS sensors. The TPS 1500 Transient Plane Source method meets the testing standard (ISO 22007-2.2).